The College of Education and Behavioral Studies has conducted a launching program of the Ethiopian Journal of Behavioral Studies, (EJoBS). The launching ceremony was held in the Presence of Dr. Jeilu Omer, Academic Vice President of AAU, Dr Hussein Kedir, Dean, College of Education and Behavioral Studies, invited guests, faculty members and students. Dr Yekoyealem Dessie, Associate Dean for Research and Technology Transfer, CEBS, AAU, and Master of the Ceremony welcomed the audience, and introduced activities of the program. In his welcome address, Dr Yekoyealem noted that the journal is the first of its kind in Ethiopia. He further extended his gratitude to all individuals and offices who worked hard to make this journal happen. 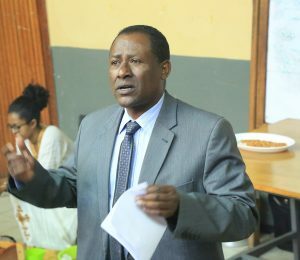 Dr Husein Kedir, Dean of College of Education and Behavioral Studies, also appreciated the efforts of all individuals and offices involved in the process of initiating and instituting the journal. He expressed that the journal would contribute a lot promoting the cause for which CEBS has been established. Dr Jeilu Omer, Academic Vice President of AAU, speaking on the occasion appreciated the efforts of the college particularly in the last few years to transforming itself so that it can meet expectations of the university and gave a direction as to how to ensure the sustainability of the journal mainly by encouraging doctoral students and supervisors to make joint publications of the dissertations to be produced. Dr Belay Tefera, Editor-in-Chief of EJoBS, gave an extended description of the journal. He noted that the importance of establishing this journal was felt increasingly important particularly in the last couple of years and, therefore, assigned individuals were working hard to initiate this journal and have it in its present form. “The ground work was, therefore, made to establish the journal with the objectives of complementing the existing Journal of Education for development, creating an opportunity for our young scholars to publish their work, allow senior faculties to leave their legacies for the young ones, and contribute a share advancing knowledge in behavioral sciences, and contribute a share in enabling CEBS become “Centers of Excellence in Education and Leadership in Ethiopia,” said Dr Belay. DR Belay also noted that EJoBS has international advisory board members widely represented from the globe (North America, Europe, Asia, and Africa), editorial board members appointed from all academic units of the College (Psychology, EdPM, Curriculum and Instruction, Special Needs Education, and Science and Math Education), and expressed gratitude to all individuals and offices who provided support for the birth of EJoBS. He particularly expressed that the contribution of the Vice President’s Office for Research and Technology Transfer was indeed remarkable. The ceremony also featured poetry recital by students from “Psych in Action Club”, cultural bread slicing program and coffee ceremony. Individuals who have made special contribution to the establishment of EJoBS received letter of recognition from Dr Jeilu Oumer.